The popular travel guide describes the area as “perhaps Ireland’s most charismatically wild and emerald stretch of coastline”. THE SKELLIG RING in Co Kerry has been named one of the top ten regions travellers should visit in 2017 by Lonely Planet. It is the gateway to Skellig Michael and the Little Skellig and is located close to the famous Ring of Kerry. “A long time ago, far, far away… a small band of monks established a hidden base on a remote, wave-pounded hunk of rock rising out of the Atlantic like a giant triangle. With a setting like this, it’s no wonder Skellig Michael made the new Star Wars location list. To get to this far-flung isle, a boat trip is necessary from the Skellig Ring, perhaps Ireland’s most charismatically wild and emerald stretch of coastline. Glimpsed at the end of The Force Awakens, Skellig Michael will play a bigger role in this year’s sequel and local businesses are gearing up for the expected visitor bump. 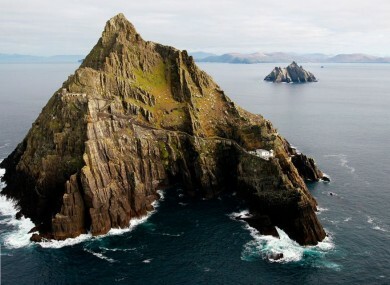 Nóirín Hegarty, operations director with Lonely Planet in Ireland, told Morning Ireland Skellig Michael’s appearance in Star Wars is not the only reason the location was chosen for the list, but said the film will open “this part of the world to a whole new generation of cinemagoers”. Hegarty said the area’s untouched landscape is relatively unique, noting it has been “pretty much untouched since the sixth century when the monks lived there”. Over 13,000 people visited Skellig Michael this year. It is closed to the public from October to April. Hegarty said Lonely Planet is “very much about sustainable tourism” and uses its travel lists to “identify places that people haven’t thought of or have perhaps overlooked”. Tourism Minister Shane Ross welcomed the news, saying: “I am delighted that The Skellig Ring is being internationally recognised as a place of rugged and ethereal beauty. Email “Lonely Planet names Skellig Ring as top destination for 2017 ”. Feedback on “Lonely Planet names Skellig Ring as top destination for 2017 ”.